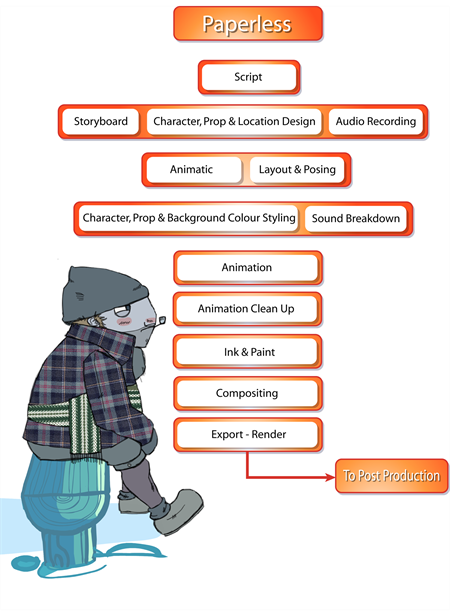 The following is a list of the steps done using Harmony in a paperless animation workflow. This will help you understand how the work is divided and give you a base to start building your own paperless pipeline. Paperless animation is usually one of the first steps done in Harmony. All of the drawings are created digitally, using a pen tablet to optimize work and drawing ability. Other than the digital aspect, the animation principles are not very different from classical animation. The animator will use the same animation styles and methods as would be used on paper–only the medium is changed. When all of the animation is done and the drawing timing is completed through the exposure sheet or the Timeline view, the scene can proceed to the animation clean-up process. The animation clean-up consists of transforming the rough paperless animation into cleaned, tied down and inked drawings. On a new layer, the clean-up artist will trace the animation following the official model pack (document containing all the official character, location/props design and colours). This step must be done very accurately. When the clean-up is over, the scene is passed along to the colourist for the ink and paint step. At this point in the process, the colour models are ready and the drawings are properly exposed. Using Harmony's optimized tools, the colourist can start applying colour to the different drawings. When the drawings are inked and painted, they are ready for compositing.